If you are using WordPress as your website builder, then you all are very well aware of the must-have WordPress Plugins. In the list of those plugins, you might have also heard somewhere about Yoast SEO and All In One SEO Pack. But, why do we need these SEO plugins? In this article we are going to compare Yoast SEO Vs All In One SEO Pack plugins and then the decision is in your hands. But, before that let’s discuss why do we need these SEO plugins. You all know SEO (Search Engine Optimization) is important for any blog post or for any WordPress website. If you are really serious about ranking your website on Google the best strategy is to install a dedicated relevant plugin. Here, you have to install an SEO plugin. Well, this is understood that optimizing a website for SEO leads to frustration, especially for those who have just started the website. We should pay gratitude to the WordPress developers. They have provided us with lots of great SEO plugins, providing ease to the website builder at every point in time. There are numerous SEO plugins that are proved to be the go-to SEO solution for the users of WordPress. By the time there are two SEO plugins that emerge at the top in no time. If all these features are met by any of the SEO plugins on WordPress, then the decision will be clear. Here of all the WordPress SEO plugins, we have chosen Yoast SEO and All In One SEO Pack on top. So let’s start with Yoast SEO! Yoast SEO was started as a WordPress SEO by Yoast in the year 2010, though the plugin was footed in 2008. It is the brainchild of Joost De Valk, which is used by millions of WordPress users. In October 2010, Yoast SEO was known as “WordPress SEO by Yoast” or “WordPress SEO” in short. But again in the year 2015, the plugin was renamed as Yoast SEO. Yoast SEO is available in 17 different languages and it has been downloaded a whopping 25 million times. These are the reasons why Yoast SEO is considered to be the most popular and most downloaded WordPress plugins ever. The developer of WordPress insists on saying that WordPress provides a great platform for SEO and Yoast can fill in some of the gaps. Yoast is considered a powerful tool that consists of a wide variety of functions. The plugin was persistently and continuously under improvements, so soon it became the major rival of All In One SEO Pack. This free plugin is considered to be convoluted and confusing by many of the people or users. On the other side, the features and the functionalities are loved by some people and hated by others. It is also said the Yoast SEO also allows you to have control over the user interface. Due to which it is possible that the “Page Analysis” feature which is famous for its uniqueness can be disabled. The All In One SEO Pack plugin and Yoast SEO are great rivals. The only thing which these two plugins do is they both have captured the SEO plugin market. All In One SEO Pack was created by two developers Michael Torbert and Steve Mortiboy. Michael Torbert and Steve Mortiboy launched this SEO plugin officially in the year 2008, and soon it became part of Semper plugins’ collection. Well, unlike Yoast SEO’s 25 million downloads till date, All In One SEO Pack has a total of 26 million downloads as well as more than a million active installs. All In One SEO Pack is simple, concise and clear. This free plugin also offers most of the options all on one page and also some batch editing features. It means if you need to update the SEO strategy of the whole website or if there is a need of meta descriptions or SEO titles in several pages. Then All In One SEO Pack is an easy option to update everything in one go. Though in some of the isolated instances, the plugin has led to troubles in the social integration features. Yet it works well when it is the question of delivering results. All In One SEO Pack is considered as the most popular WordPress plugins of all times, as it is the most downloaded WordPress plugin ever. I am hoping you have got the general knowledge about both the plugins. But till now we didn’t start with the comparison side of both the plugins. This is important to note that this is basically a “tug of war” what is going on between the two plugins. So, the comparison is not one-sided, but both the sides are equal. We are starting with the Features War, firstly! 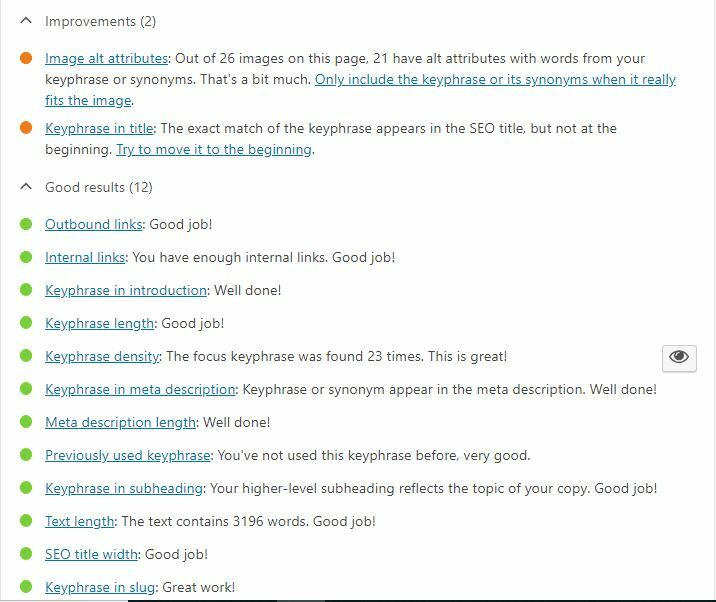 As I have told you earlier also, both the plugins Yoast SEO and All In One SEO Pack, works in a similar way. Now, you might be thinking, what is the use of writing the article? Look, I have said they work in the same way but they are designed and featured in a way that makes them so unique in itself. Yoast SEO is very simple to use. This free plugin is available in the WordPress Plugin directory. Just like any other plugins on WordPress, you can simply install it onto your website. After installing you need to activate the plugin. So, you just have to follow what the WordPress will make you do and rest will be done itself. Once you have installed and activated it, the work is over. Now, let’s go to the posts and what we will see is right out of the box, Yoast SEO will integrate itself into your website’s editorial pages. Whenever you are ready to start with your On-page SEO, you will notice the Yoast SEO tab. Under Yoast SEO tab you will find 4 more important tabs, which falls under “Content Optimization” category. Let’s look at the tabs that come under this category, which makes Yoast so unique. Under the Snippet Review tab, you have to fill in the spaces provided. By filling these spaces we will be able to get an appropriate SEO Title. This will give an identity to your blog post on the search engines like Google, Bing etc. The next space is Slug. You have to fill in the focus keyword in the slug area. Make sure your slug does not contain any stop words. Meta Description is another important space to fill in. Your Meta description should be small, concise and very clear. The first line should contain the focus keyword for sure. The Meta Description will attract more and more traffic to your website. This basically analyzes your whole page or post. 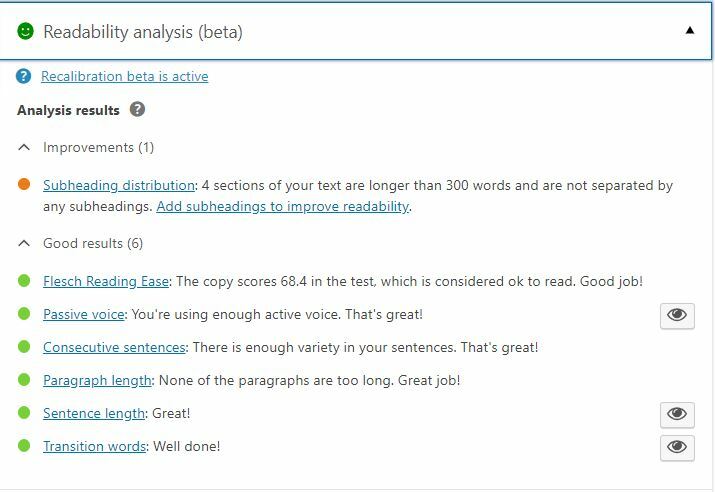 Readability analysis will tell you whether your page readability is good or need some improvements. The analysis is based on the grammar you use on the page. If any of the points need improvements they will notify you. One thing to be noticed is that, if you see the Readability analysis green, then it is good to read. In our earlier articles, we have many times discussed keywords. You all very well know that in the absence of relevant keywords on the post you will not be able to rank high on the search engines. High quality and relevant keywords will help you to grow and generate higher traffic on the website. So, you have to be very careful while choosing your focus keyword. A small and clear focus keyword will help you rank high in the digital marketing market. You have to remember the analysis is based on the number of times your focus keyword has appeared on the blog post, the internal links, the outbound links etc. 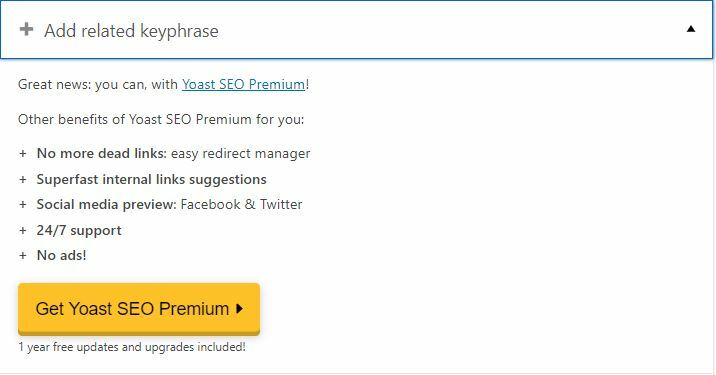 You can only add related keyphrases only with Yoast SEO Premium. This is a paid and upgraded version of Yoast SEO. After the Content Optimization Tab, let’s move on to the next category. This category is related to Social Media and named “Social”. Under the Social tab, as shown in the figure above, you can integrate with both Facebook as well as Twitter. 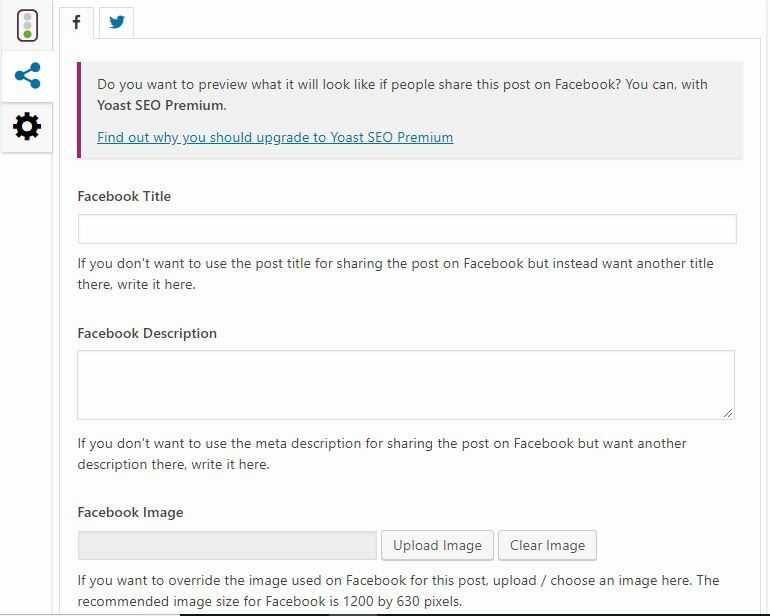 While using the options here, you will be able to choose your own title, images and descriptions of your post to be published or posted on Facebook. Now last but not the least, after the “Content Optimization” and “Social” category” in the Yoast SEO, is “Advanced”. Here, you will be provided with the options of setting up the page. As you can see, there are three options given to be filled mandatory. The first one allows your post to show it in the search results by choosing “Default for Posts, currently: Yes”. 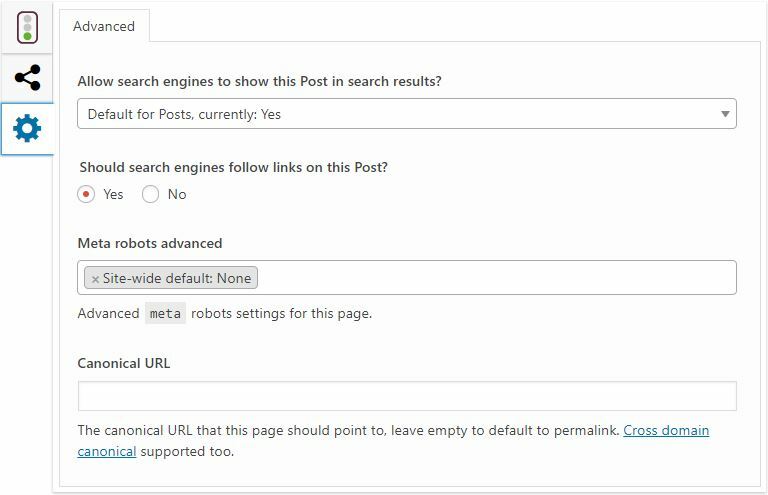 And the second option is asking you to allow the search engines to follow or nofollow the links on the post, so you have to select “Yes”. The third option is about Meta robots advanced, which is basically the advanced Meta robots settings for the page and you have to select “Site-wide default: None”. If you will look at the fourth option, it gives you options for setting Canonical URLs. Well, this is it with Yoast SEO, when we talk about the features part. Most of the time the beginners will not go forward and they are assured knowing that the Yoast SEO works very well. This is only one side of the story, the second part that is we didn’t talk about the All In One SEO Pack yet. So, please hold your breath and hope to be something better than this. In the article above we have talked about Yoast SEO and its features. Let’s see how many balls are there in the court of All In One SEO Pack plugin. Like Yoast SEO, All In One SEO Pack is also available within the WordPress Directory. So, the installation, as well as the activation process, is really easy and simple. After the activation is completed All In One SEO Pack automatically integrated onto both your list views of pages and posts as well as your “Edit Pages”. Firstly let’s talk about what all you can do from the list view of All In One, instead of rushing up directly to the settings. You can Edit SEO titles and Meta Descriptions here. This is something which is offered by All In One SEO only and not by Yoast SEO. It becomes easy to change the SEO titles and Meta Descriptions all at once for the posts and pages while you use All In One SEO. However, this is only one part of the comparison between Yoast SEO Vs All In SEO Pack. As soon as you click the edit page you will be followed to the page which will be absolutely different from the Yoast interface. It contains two tabs only and you have all the options covered under these two tabs. So, let’s get started with the first category. Here you will be provided with options of inserting meta keywords, writing appropriate meta descriptions as shown in the above-shared picture. On the more, you can also choose to follow or nofollow the particular page or post. You also get the option of choosing index or noindex to this page. And if this is not enough, then you can also make a choice of excluding a page from your website’s XML sitemap. So, let’s move on to the next category, which is “Social”. When you click on the “Social” tab, you will be offered numerous options, which you will not get while choosing Yoast. 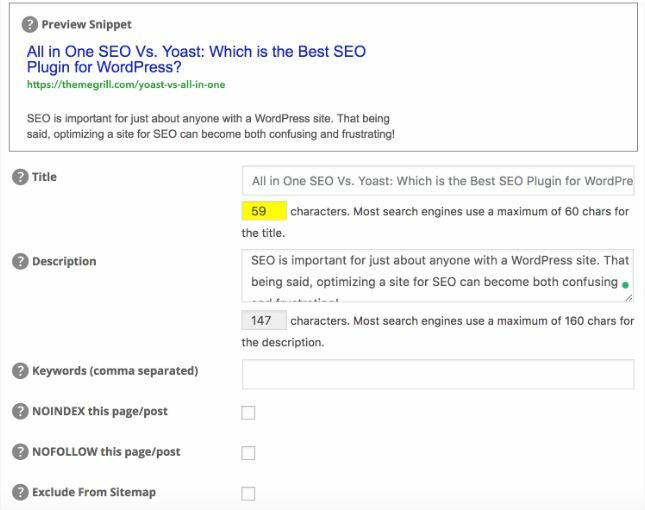 Similarly to Yoast, All In One SEO allows you to choose your SEO title, meta description as well as images that are unique and relevant to social media. Apart from these features which are similar to Yoast, these options are really accompanied by some more additional features. All these extra additional features which All In One is offering a focus on the technical side of the things. Through these features, you will be able to upload the image and its settings can be done in one go. You can also do settings for your Facebook and Twitter posts. All In One SEO, just like Yoast works really well out of the box. But this is not it! Users should not rush into choosing anyone. They have to look at the plugin’s settings and other important aspects, which will assure users that everything is set properly for the effective optimization of efforts. So, let’s move on to the next point of comparison between Yoast SEO Vs All In One SEO Pack. In this comparison war, we are looking for a plugin which helps the most with the Content Writing. So, for this heading or feature, the winner is clear. I consider “Yoast” to be the winner. Yoast is always known for its “Page Analysis” feature. You all know very well that the “Page Analysis” tool is hard to come by in any SEO plugin. This is really a great tool for the beginners as well as for the veterans. 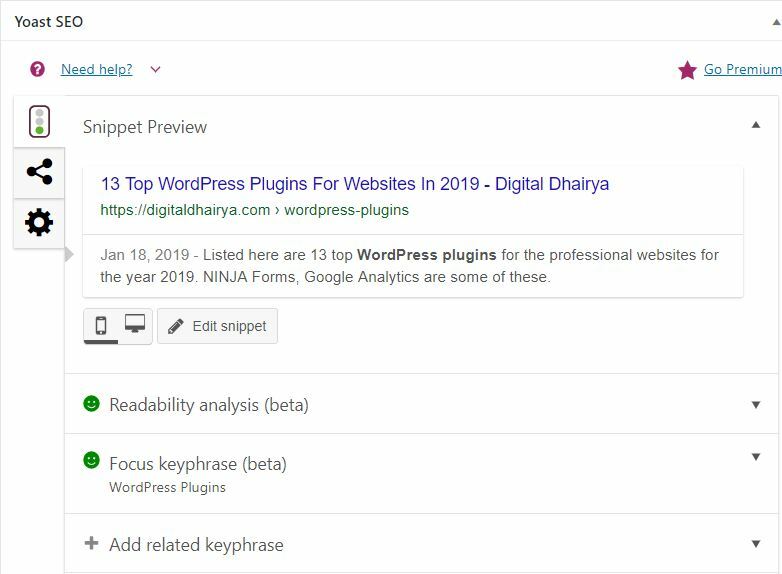 As shown earlier in the article, immediately you choose your Focus keyword, the Yoast SEO plugin analyse the content that you are going to publish. In the analysis list, it guides you by telling how you will be able to improve your page’s SEO performance. Well, this is not the end of the Page Analysis tool. It is a lot more to what we can see. It may not be wrong to say that the scores which are given through the tool, are inaccurate or irrelevant according to your needs. Still, the analysis is considered to be the SEO best practices in almost every case. [NOTE: Here, it may not be wrong to declare Yoast SEO as a winner for SEO analysis, with its “Page Analysis” feature]. You might be thinking, why I am talking about saving time. What a plugin can do in that matter? Look, the simpler the things are the clearer and easier they are to handle. So, now in this comparison war, we are looking for a plugin which can save the most time. 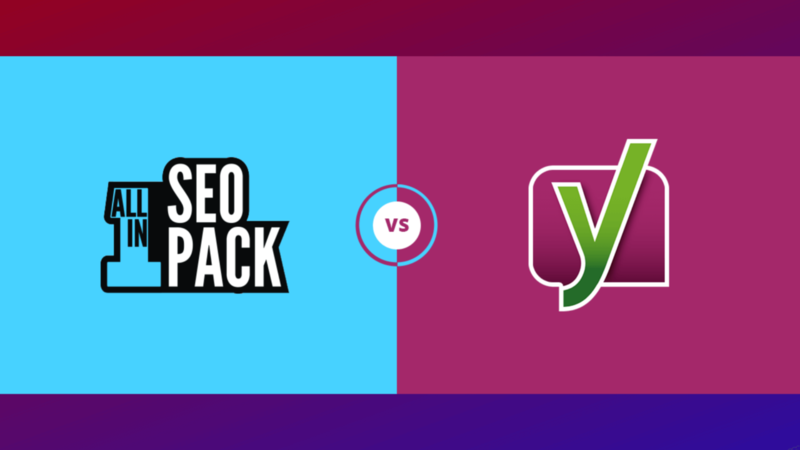 Yoast Vs All In One SEO Pack! When you download a plugin or let’s say an SEO plugin, one of the questions that surround your mind is that it should be reliable and time-saving. In this case of Yoast Vs All In One SEO Pack, the choice is not straight and simple. Ok then, let’s talk about All In One SEO first. This plugin provides you with “batch editing” feature. It is good for those who are starting their website from scratch and are in search of widespread SEO related updates. So, All In One can be declared the winner, because it offers the easiest way to institute these changes. On the other side, when we come to the Yoast “Page Analysis” feature, we can say that it is the biggest time saver in the long run. The Page Analysis feature, as we have discussed has the ability to oversights, catch mistakes easily and fast, and optimization misses is invaluable. [NOTE: Here, in the comparison above, we cannot clearly declare a winner to anyone. You can choose any one according to the individual needs and requirements. As All In One offers you “Batch Editing” and Yoast offers you “Page Analysis” feature]. Yoast Vs All In One SEO Pack: Which Plugin is Easier to Use? In this comparison war, we are going to give priority to the user experience. When we keep an eye on the user experience we have found that Yoast and All In One SEO are very different from each other with this regard. In case of All In One SEO, you as a user has to be aware that the options or features offered are not presented properly on a single screen. The plugin might take a little bit of navigating in order to find the right settings for your post. While on the other side, if we talk about Yoast SEO, then we can say that the interface is very clean in appearance. The features are very well offered and don’t show any mess. When we know that, all significant settings are listed under one category tab, it has become a plus point. The reason is that of this it is harder to forget some simple things like adding a Meta description or indexing or noindexing a page. 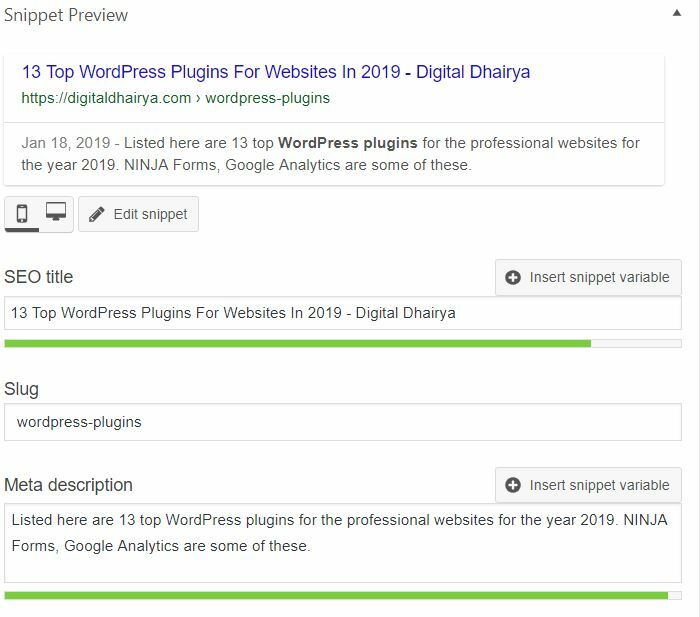 Well, the Meta descriptions, the Meta keywords, and the SEO title can be updated from the “Pages” or “Posts” lists within the WordPress dashboard. This simply means that the batch editing is really simple. [NOTE: Here, Yoast Vs All In One SEO Pack, it would not be wrong to say that All In One SEO is the winner, with respect to the overall user experience]. While we are talking about Yoast SEO Vs All In One SEO Pack, we are looking for the plugin which has the best support system. When we look at the services offered by both the plugins individually, we have found that both the plugins are on the same level. It is to be noted that none of the service providers offering personalised customer support service to the ones who have installed the plugins for free. On the other side, personalised customer support service is offered to those users who have subscribed to the pro plans. When we talk about plugins and their comparison just like Yoast SEO Vs All In One SEO Pack, then Social media plays an important role. We all are digital marketing professionals, and we very well know the importance of social media, in the life of an individual as well as an organisation. In order to reach out to maximum people, social media marketing plays a vital role. So, while keeping this in mind social media integrations are important. Though social media integration is important, yet optimizing for it is the most important task to be done. well, in the war between Yoast SEO Vs All In One SEO Pack, both the plugins offer you to easily set up social media integrations both for Facebook as well as for Twitter. However, there is an added benefit which only All In One is offering. 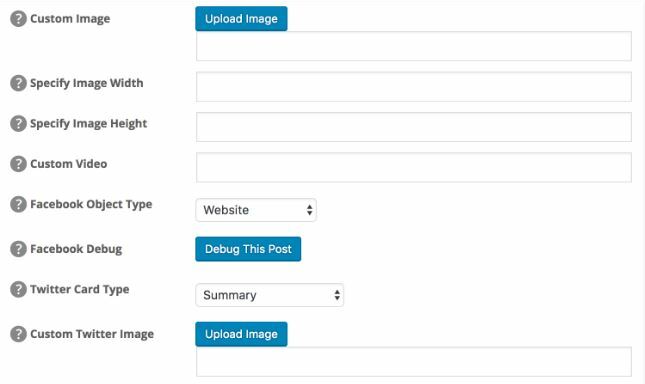 This SEO plugin allows for Facebook debugging and that too directly from the WordPress. Although this is not a big deal, because debugging of links only create an added hassle. [NOTE: After reading this we can say that both the plugins are sailing in the same boat. So, both are at an equal level for me]. After all the features we have discussed above in this article Yoast SEO Vs All In One SEO Pack, one important thing which we have not discussed here is the “Results”. How Yoast and All In One SEO affect optimization efforts? That means users are keen to know what kind of results both plugins produce. Look, you know that both the plugins Yoast SEO and All In One don’t create content for you, so the testing results will not always be easy. If I look at the reason for this, then we usually concentrate more on ensuring that the pages are very well optimized. They are optimized not only with great content but also with on- page and off-page signals. So, if we are concentrating on better optimization of pages, then both the plugins are producing effective results. Actually, they are developed in ways, which have a reputation for being effective. When we look upon the SEO side of both the plugins then there is no problem at all. You can set Meta descriptions; develop XML sitemaps as well as you can also create SEO titles easily. Once you are done with this information, you will be confident enough. The changes made by you using any one of the plugins will be reflected on the search engine result page (SERP) as well as on your website. This completely means that you can choose any of the plugins Yoast SEO or All In One SEO Pack. Both the plugins are free from the reputation of slowing down the speed of your website. They don’t have the security issues as well. Both the plugins are highly reviewed by the users using them. It is said that in any SEO effort, plugins are just a supplement and not a strategy. In the comparison between Yoast SEO Vs All In One SEO Pack, we have discussed both the sides. Yoast SEO serves its own intended purpose and same with the All In One SEO Pack. At some point of time Yoast seemed to be a good pick and at the same time, on some matters All In One. They are alike at some points, but on the more both the plugins offer some unique features, which we have discussed in the article above. Please keep in mind if any of the plugins are not your cup of tea, then there are other options available. The reason why we are talking about Yoast SEO Vs All In One SEO Pack is that they are popular for some reasons. They are good and highly reviewed. Otherwise, there are lot more plugins, who are the rising stars. Some have a good reputation and may be worth looking into the features they are offering. There may be some, which click you and fulfil your website’s need and requirements, and offering more features in comparison to the Yoast SEO and All In One SEO. Doesn’t matter what plugins you are using, you have to focus on the content and the SEO result. 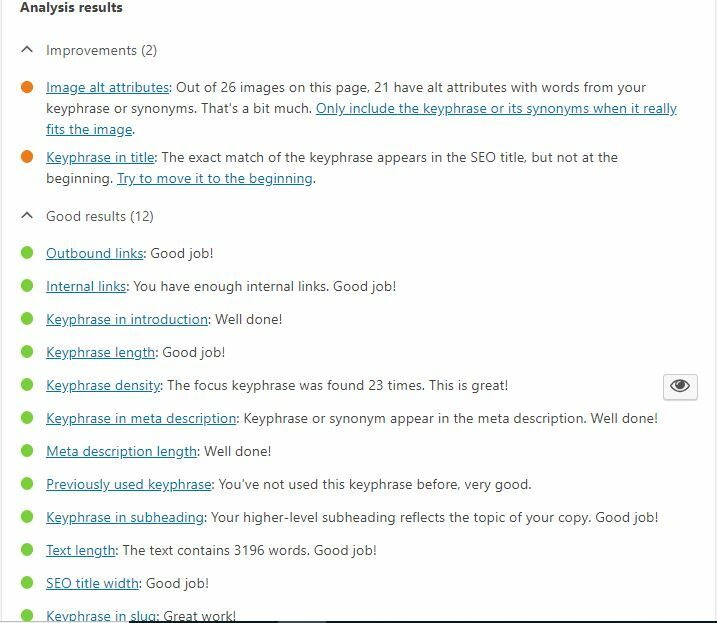 I hope the article Yoast SEO Vs All In One SEO Pack, is worth reading. You can write to us at digitaldhairya@gmail.com. For queries please fill the FORM here.